Failing schools or failing students. Are American schools failing? Or are American students? A staple of American journalism and political commentary is the sorry state of American public schools. The standard refrain one hears is that American public schools are failing their students. Schools are either too crowded, teaching standards poor, schools districts operated for the benefit of teachers and administrators, or that the entire system is just plain dysfunctional. If you follow the standard narrative, all the faults lie with the public school system. Yet, much of the blame for poor academic performance must be placed on our broader society and factors outside the control of our schools. What if we changed the standard refrain and said instead American students are failing school? If you think American public schools are failing their students, all your remedies will focus on schools and teachers. If, on the other hand, you say American students are failing school, we may begin to look for another set of remedies, in the home. These might include setting higher expectations for student academic achievement, perhaps even raising the expectations we have of their families. I should start off by saying that I have no first hand experience with public schools in America. I graduated from a high school in Bombay, and entered the American educational system as a college student. Virtually everything I’ve learned about the schools has been as an outsider. I don’t have children yet, so I haven’t had to deal with the schools from a parent’s perspective. But there are some stark differences I see when I compare and contrast my own education with what I’ve gleaned about the American public school system. I wouldn’t hold my school or the Indian system of education out as the perfect model model. It has many faults, and one glaring one, the relentless emphasis on rote learning, made me (and many others) opt out of it when it came time to attend college. The public school system in India is also prone to the same corruption that riddles most state institutions. Yet, I can’t deny that the rigid, unforgiving curriculum and its emphasis on tests virtually ensured that we knew how to read, write and had acquired a basic understanding of science and mathematics. It wasn’t very good at encouraging critical thinking, but we did acquire the fundamental skills and knowledge required for further academic success. The rote learning also gave us some facts and figures on which we could practice any critical thinking skills we were lucky enough to acquire. 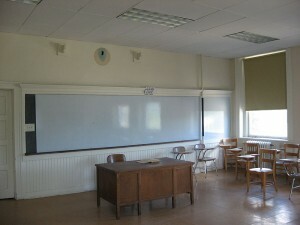 Expanding class sizes are often cited as as a problem for US schools. Yet classes tend to be a lot smaller in most American public schools than I was used to, or those in most Asian schools. All my classes from second grade onwards had at least thirty children in them, and we had forty students to one teacher in each class by fifth grade. Yet classes were relatively strife free and efficient, largely because the burden to learn and retain material was firmly on us, never on the teachers. Brute force and repetition was, and is, in large part the answer to everything in Asian schools. If you didn’t understand a concept, you worked on yet another group of practice problem sets, till eventually you understood the pattern. The expectation was for hard work from the student, not creative presentation from the teacher, on learning, not teaching. I can’t recall ever thinking it was a teacher’s responsibility to make the material interesting enough for us to learn. It was my job to understand and retain it. We certainly complained about the dull textbooks, and I would definitely have liked to pin the blame for academic under-performance on a teacher or two, but I’d have been laughed out of town for trying that. No doubt, we had teachers who inspired us, and others who didn’t. Our Hindi Literature teacher, for instance, has a popular fan page on Facebook, populated by students who remember his classes fondly from 20 years ago. I can still recall his passionate lectures vividly, and many of us looked at Hindi Literature differently after his class. Few of us though, have continued to read Hindi literature, he was fighting a losing battle against an urban culture in Bombay which aspired to speak English, and a wider culture that valued hard sciences above anything as impractical as literature. The broader culture won out despite his best efforts. Which is where I’ll start next week. Steven Brill writes in the New Yorker about the Rubber Room, a group of facilities where NYC teachers who are undergoing disciplinary proceedings and not authorized to teach spend their days while collecting full salaries, for months and years on end. The whole thing makes no sense, but is an illustration of special interests holding taxpayer resources hostage. Ira Glass and the team at This American Life aired an episode about the rubber room earlier this year.